This paper explores the extent to which Cuban remittance recipients are responding to the Cuban government’s economic reforms which seek to incentivize entrepreneurial activities as an economic growth strategy and to state liberalization policy. The analysis is based on fieldwork and a survey of remittance recipients in Cuba (see Appendix for a description of the survey). The findings show that remittances continue to play an important role in the economic survival of Cubans, with money coming from the U.S. and other parts of the world. We find that an important proportion of recipients want to own a business and some already have established one. The businesses that remittance recipients have established or aspire to establish are geared toward the service sector and led by micro-enterprises aimed at achieving self-subsistence rather than wealth generation. In light of the reforms introduced by the Cuban government, there seems to be a mismatch between government policies and people’s needs and interests. Many of the economic activities that remittance recipients would like to undertake through small businesses are not within the scope of the new reforms. Moreover, these policies may not be sufficient to enable an amenable environment for business development. In light of these shortcomings, there is an expectation among remittance recipients wanting to set up a business that remittances and families abroad will help them finance their businesses. However, given the global recession and particular socio-economic situation of many Cuban remitters, these inflows do not constitute a formal mechanism for small business development, and should rather function as a complement to possible policy and development incentives. Given the precarious position of on-going and potential businesses, and reforms that would provide limited incentives for growth, it is important to consider implementing strategies that respond to the prevailing conditions of these enterprises, such as micro-credits, wholesale markets, technical advice on business development and financial training. Remittances have continued to flow into Cuba, with the flows having four characteristics (Table 1). First, the U.S. continues to dominate transfers, but with less presence than in earlier periods; transfers from Europe and Latin America have increased in importance. Second, despite the 2009 changes in U.S. remittance policy to Cuba, few remittance transfer operators have entered the market and the use of informal transfer mechanisms continues. Third, the amount received has remained the same or declined, most likely a symptom of the recession. Fourth, remittances continue to represent at least one half of total income of recipients, who are able to save though they tend to do so informally. The following paragraphs elaborate on these characteristics. According to survey data, 68% of remittance recipients interviewed received money from relatives in the United States, 13% received from Europe (primarily from Spain) and 19% received remittances from Latin America and other developing countries, of which 8% were from Cuban workers in Venezuela. This last observation can be explained by the stronger relations between Cuba and Venezuela, including labor contracts to bring doctors and nurses to Venezuela. As to transmission channels, informal networks continue to be prevalent. Although policy changes in the U.S. have liberalized previous restrictions set in 2005, few businesses have entered the remittance market to offer transfers to Cuba. Note however that informal transfers from the U.S. are lower than those from Latin America, where most recipients said they still rely on friends or mulas to receive money. With respect to value of remittances flows, transfers to Cuba have not increased despite the economic recovery and relaxed restrictions. In fact, amounts have not changed substantially in relation to previous years. A major reason is that the cities from which flows emanate are places where economic recovery has been the slowest; this includes southern Florida, Madrid and Barcelona. Moreover, though remittances from Latin America have been growing in volume, they typically represent lower amounts remitted, further reducing the averages. However, sending frequency has increased to eight times as opposed to six in 2005. Recipients own few assets (Table 2) that could serve as resources in productive or commercial activities and most do not own bank accounts (87%). However, all of the respondents acknowledge they save utilizing various methods, most of which are informal. While their assets are limited, they have accumulated liquid assets (Table 3) in the form of cash savings amounting to a reserve or stock of nearly US$900. These data suggest that the characteristics of remittance recipients have not changed substantially in the last five years despite policy reforms in the U.S. Informality would have been expected to decrease and the amount sent to increase as a result of the initiatives by the Obama administration. However, changes and adaptation to Cuba policy are slow and may take longer for Cuban migrants to change their practices, particularly given the slow economic recovery. Another important point to highlight is that income dependence on remittances invariably remains below 60%. Cuban remittance recipient earnings range under $100 a month. This figure is important in that it points to a few broader issues that relate to the size of the Cuban economy. Specifically, remittance recipients earn incomes above average, but even using their average income as a reference for the entire population, it would mean that national income is less than US$25,000 million as opposed to the officially recorded US$40,000 million. Earnings among remittance recipients also hint at the extent of the size of their financial stock—typically, remittance recipients save more than non-recipients and in amounts between US$1,000 and US$2,000. Together with other assets, these funds constitute a basis for potential business investment. The efforts of the Cuban government to reform its economy by encouraging small business entrepreneurship among its population has brought attention to the potential role of remittances and their recipients in triggering business development.1 Before exploring that role, this section offers a brief overview of the economic strategies and reforms approved by the Cuban Communist Party’s Sixth Party Congress. Boost exports, strengthen the currency, and increase wages through increased output and productivity. Given the changing context for small businesses and the assumption that remittance recipients may be more prone to invest in a business, this section explores the extent to which these recipients might decide to engage in a business activity. The results show that there are three distinct groups: those who are not planning to establish a business, those who are, and those who already own a business. Forty three percent of recipients expressed they would not form a business in Cuba, whereas 34% expressed that they would, and 23% said they already had a business. Here we focus on those who are interested in setting up a business as well as those who already have a business. However, it is important to mention that the large number of people who said that they would not create a business stated as their main reasons for not doing so the following: lack of resources; lack of entrepreneurial know-how; undependable/risky economic/ political context. In other words, it is not that this group is per se uninterested in starting a small business, but rather that its members’ current situations and the wider context make it unviable for them to do so. Moreover, among those planning to establish a business or who already have one, a general finding is that, given their economic position, this is a population whose potential and actual businesses are limited to subsistence enterprises. 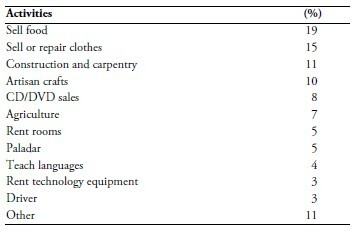 Those interested in establishing a business are primarily men (67%) and suggest they would invest predominantly in a commercial activity involving food or clothing, while a fifth would be interested in a manufacturing trade (Table 4). The activities listed as potential lines of business included the sale of food, clothing, or CDs/DVDs. These activities are a partial fit into the list of businesses that the Cuban government has announced that could be allowed by the state. When asked about the purpose of a business, the majority expressed that the business would be a complement to their current job or as a survival strategy should they lose their current job (Table 5). Only a small group (9%) stated they wanted to own a business as a matter of interest. These responses are important in that they provide clues as to the direction of possible entrepreneurial activity. Those who engage in a business out of necessity due to job loss or to add to their income are less likely to grow their enterprise substantially after achieving self-subsistence. Moreover, if the business is unable to obtain financing, and strengthen its marketability through additional training, its competitive edge decreases. When thinking about the position of a business in the market, a successful enterprise is the result of various factors, such as access to capital, linkages to the value chain, entrepreneurial skill and support from the regulatory environment. Even when a business is created out of necessity, getting access to financing, being competitive or enjoying government support or incentives can help these businesses to grow and accumulate wealth. In turn, enterprises are able to reinvest in jobs, machinery, or accumulate personal wealth. A closer look at remittance recipients shows important features that characterize their potential for engagement and performance in the business environment as it pertains to available resources, access to financing, and expertise in the trade. 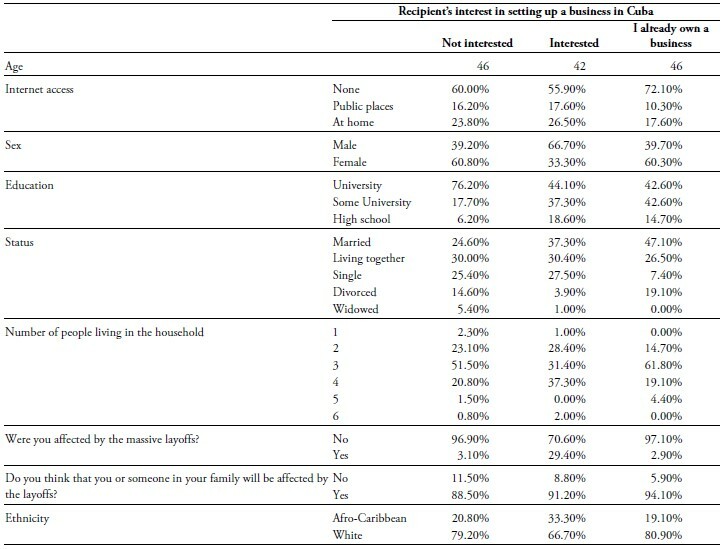 Overall, 95% of those interested in setting up their own business consider that their investment would involve less than US$5,000 and most likely under US$1,000.4 Moreover, when asked about what resources they had available to start the business, one quarter affirmed they already had sufficient savings, whereas 30% said they already had a locale to operate, and 16% had working capital. Those with cash in hand and working capital held a stock of savings worth up to US$1,600 (Table 6). In addition to their existing investment stock, remittance recipients were asked about sources of financing that could complement their initial investment, business upkeep, and available guarantees. Just over a quarter stated that their own resources served as their additional financing source, and nearly two thirds responded that they would seek financing from relatives living abroad (Table 7). This dependency or expectation of support from relatives abroad confirms similar expectations in the media about the role of the Cuban community in the United States in particular. Moreover, no one considered institutional support to finance their business, and for the most part they saw their savings or the relative abroad themselves as a guarantee to financing. Despite their financial weakness and no formal access to the financial sector, most of these individuals have some experience in the trade in which they plan to engage (Table 8). Such condition would give them an edge were they to compete in the market, unless it is already saturated. These responses point to individuals seeking to form relatively small, subsistence operations, for which they will depend on support from families living abroad and that may be outside the scope of government intervention. In turn, they will have a limited impact on economic growth and business development. Those who already owned a business (23%) share similar characteristics with those who want to start a new one, except that 60% of current owners are women compared to 33% of those interested in setting up a new business. 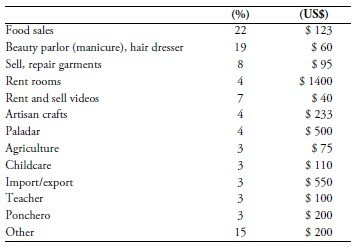 the average value of monthly sales is US$200 (Table 9), an amount that may add little to their total income. Because more than half of their income is coming from remittances, these entrepreneurial activities may complement their earnings from additional work but may not represent half of all income unless 40% of their sales go into salaries. typically operate their businesses out of their place of residence (80%) or are street vendors (12%). The results of the survey show that Cuban remittance recipients continue to rely on such flows to manage their day-to-day survival. Moreover, there are indications that those interested in setting up a business, or who already have one, are predominantly operating at a subsistence level and are not able to generate additional wealth. As Cuba promotes self employment, it is important to consider the issues that may contribute to the development of small businesses. It is also important to understand the correspondence between the type of enterprise emerging in the Cuban context, resources needed to strengthen and develop these into successful enterprises, and the short and long-term impacts. In any society, small businesses are faced with striking a balance between achieving success and overcoming challenges. Depending on the type of business, the issues to deal with may vary. Their business success depends on achieving increasing profit margins, maintaining financial liquidity, covering labor costs, promoting innovation, and consistently selling quality goods or services. They also are confronted with various challenges, some inherent to a business (capital access, linked to value chain) and others associated with the global economy (managerially and commercially competitive) and the motivations of entrepreneurship. Because current Cuban entrepreneurs are predominantly subsistence enterprises, what is critical is to identify the instruments that can enable these businesses to develop and grow as enterprises that can generate wealth. This may mean looking at the development of their business capabilities, their insertion into the global and domestic value chains, their access to financial resources to function and expand, as well as the incentives they would need to operate in a formalized environment. Relying on remittances or savings accrued as a primary means to invest is not an ideal situation, as such resources are typically fungible and can be used for various other activities. Savings can serve as part of a financial guarantee for a loan but not as the primary financing source: if they are depleted before the business fully develops, the enterprise can fail and the entrepreneur is left worse off. The role of microfinance is pivotal as it can help put these businesses in a better position to expand their activities and become sustainable. Moreover, microfinance would give non-remittance recipients the opportunity to gain access to credit and enter the emerging small business sector. Because on-going businesses do not generate annual revenues over US$3,000, projecting the right amount of financing needed to help a business grow is part of a financing strategy. On that basis and assuming about 100,000 small and micro enterprise operations were created as a result of the reforms, credit portfolios may need to reach at least US$300 million. Training to orient interested entrepreneurs towards activities that are competitive, are directly connected to commercial value chains, and exhibit the potential to reach economies of scale is important. Many of the respondents were interested in setting up businesses or activities that may not be competitive, or may be market saturated. Thus, assessing the marketplace for commercial and productive activities can coincide with technical advice to businesses on where to invest and establish their enterprise, and how to go about it. There are no wholesale markets in Cuba at this time. In order to make it worthwhile for people to seriously contemplate creating a small business, the Cuban State would do well to sell goods and materials at whole sale prices. The current regulatory environment is not friendly to entrepreneurs. Taxation by the state is quite onerous and will strangle the capacity of businesses to operate and reinvest in business growth; such an environment will not prolong subsistence-level businesses. Exempting new businesses from paying taxes during a certain period and gradually introducing them into the tax structure can help them grow in the short term. Because the established and anticipated small business operations would be run by the owner himself/herself, providing financial advice about money management in a household with two or more sources of income would be an important strategy. Small businesses typically have very poor accounting procedures and often mix business revenues with other sources of household income, making it difficult to ascertain how the business performs. The survey in Cuba was conducted in various cities across the country. Researchers worked on a representative sample of the population’s social, demographic, ethnic, regional, and social strata. However, given the Cuban political context, researchers did not do random street interviewing but instead the sample units relied on the snowball procedure among people that could be interviewed in confidentiality. The sample size was 300 remittance recipients. 2. The musical group “Los Mambises” and dance duo “Amor” are examples of the surprising specificity of the regulations within the performance category. “Actividades autorizadas para el ejercicio del trabajo por cuenta propia.” Juventud Rebelde. September 24, 2010. online. 3. Espinosa Chepe, Oscar. Cambios en Cuba: Pocos, Limitados, y Tardíos (Havana 2011). 4. US$1,000 is less than the average saved and would represent the minimum start-up investment, plus the resources they say they would use to establish the business. Katrin Hansing is Associate Professor of Black and Hispanic Studies at Baruch College, City University of New York (CUNY). Manuel Orozco is Senior Associate and Director of Remittances and Development at the Inter-American Dialogue, Washington, D.C.